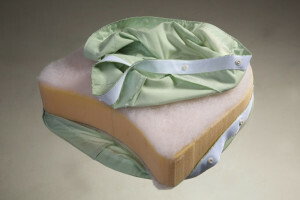 This ear pillow has been successfully used in hospitals in Wales and the North-West since 2008 as an effective treatment for chondrodermatitis nodularic chronica helices. Also used as a phrophylactic aid in Dermatology and Otolaryngology departments. 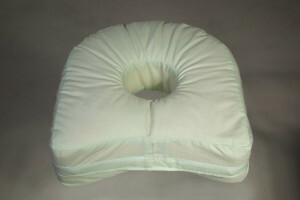 This pillow was specially designed to meet the demands of patients, with regard to infection control and ease of use. 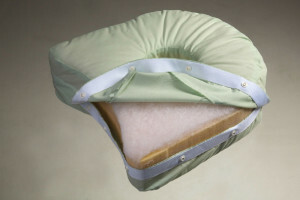 The shape of the pillow follows the contour of the shoulder and back to ensure maximum comfort. 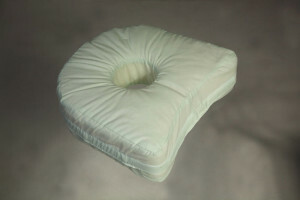 The inner filling material consists of a very comfortable “luxury soft” heavy duty foam covered by a polyester wadding(The Polyester wadding and the foam are flame retardant and conforms to BS5867 part2, making it suitable for contract use).